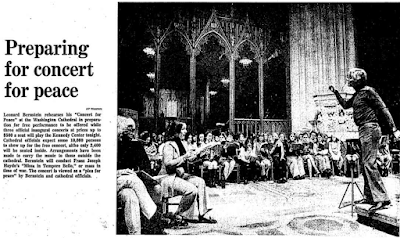 Several miles to the northwest, at the National Cathedral, Leonard Bernstein directed members of the National Symphony in a concert called “A Plea for Peace,” an alternative event timed to coincide with the official concert. The only work on the program was Haydn’s Mass in Time of War – the conductor had selected the work in consultation with the National Cathedral’s dean Francis Sayre, who was a leading Vietnam War protester, as was Bernstein. (Tooley 2008) The free concert drew a large crowd – the cathedral could only accommodate 3,000, and the overflow of 12,000 people remained standing outside in the rain, listening to the events through a poor p.a. system, some of them waiting six hours for admission. (Dionne & Lindsay 1973) As Washington Post columnist Henry Mitchell reported, “in case any didn’t get the message from Haydn’s “Mass in Time of War,” it was… introduced by former Senator [and presidential candidate] Eugene McCarthy, poet and early leader of the peace movement.” (Mitchell 1973) McCarthy’s embittered words did not inspire much hope for results: “through arguments and persuasion, appeals and petitions, … all of us here have exhausted all of the means open to us and yet the war has gone on.” (Mitchell 1973) The performance featured unpaid soloists (Patricia Wells, Gwendolyn Killebrew, Alan Titus, and Michael Devlin), a paid orchestra of 50 local players and a chorus of 125 singers. The New York Times called the concert a “plea for peace rather than a protest, but the choice of music alone made clear the counterpoint [to the Kennedy Center event].” (Robenalt 2015) Under the title “Haydn and Peace,” The Washington Post review identified Haydn’s work as “a rallying point of anti-Nixon sentiment.” (Mitchell 1973) Though the concert occurred near the end of the Vietnam War, it became a landmark event within the history of the Vietnam protest movement: important for the future was the appropriation of Haydn’s Mass as a vehicle for peaceful protest of war. The significant national and international press coverage undoubtedly made the counter-concert a model for similar events in coming years. Thus, for three different performances in protest of the Iraq War—in 2003, 2007 and 2008—Bernstein’s own iconic 1973 concert figured prominently in the published thoughts of organizers and commentators. The political context of the January 2017 protests may fully differ, yet the parallels remain: music and musicians are being mobilized to demonstrate against an unpopular president whose character and policies threaten the fabric of the nation, as Nixon’s did in 1973. Associated Press. “Nixon’s Night for Music. A Protest Concert, Too.” San Francisco Chronicle. January 20, 1973, 16. Hume, Paul. “Plea for Peace.” The Washington Post. January 11, 1973, C1. Mitchell, Henry. “Haydn and Peace: Of Mass, War and Peace.” The Washington Post. January 20, 1973, C7. Nixon, Richard. Dairy Entry, January 19, 1973. Cited in Frank Gannon. “Leonard Bernstein’s 1972 [sic] Counter-Inaugural.” Richard Nixon Foundation. August 28, 2009. Robenalt, James. January 1973: Watergate, Roe v. Wade, Vietnam, and the Month That Changed America Forever. Chicago: Chicago Review Press, 2015, 245. James Deaville teaches Music in the School for Studies in Art and Culture at Carleton University, Ottawa, Canada. He has edited Music in Television (Routledge, 2010) and has co-edited Music and the Broadcast Experience (Oxford, 2016). He is currently working on a study of music and sound in cinematic trailers, a result of the Trailaurality research group and co-editing an anthology on music and advertising as one of the Oxford Handbooks.